CFD is a trading instrument that has emerged relatively recently, but has already won its fans in the market. Many investors and market traders try to try to trade with it. But what is this tool and what is the essence of trading using CFD? This is a financial instrument of the market, which arose relatively recently. This is a price difference contract that allows you to trade in various assets - shares of large corporations, gold, oil, gas, nickel, cocoa and others. The need for a CFD arose in order for private individuals to invest in a particular area of the financial market. In other words, this is a type of financial asset that is a contract for the difference between the opening and closing prices of a transaction. To date, the range of tools and assets available for work in the trading terminal of the trader has significantly expanded: the choice is so huge that brokerage companies began offering their clients certain types of accounts for trading using the CFD asset. That is, when trading a CFD, a trader enters into a contract to close which we receive a profit (or loss). This is the difference in price between the opening of a trading operation and its closing. The result obtained, in the form of profit or loss, depends on where the price of the asset rushes. This is a very useful tool. With the help of CFD, any stock trader can try to trade using shares instead of currency. 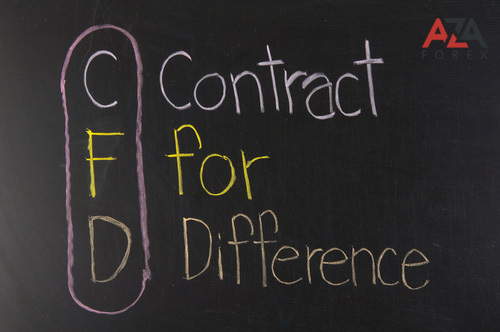 The only difference between the currency and CFD is the specification of the contract itself. But what exactly is the difference between trading stocks and trading on CFDs? The main difference is that when trading real securities in the stock market, you need to have an impressive amount of capital, tens of thousands of dollars. And when buying shares, you need to pay the exchange commission. This is done to include the investor in the list of shareholders. It not only hurts on a pocket, taking away money, but also spends a lot of valuable time. Because of the loss of time, the trader can not receive income from exchange rate differences. In addition, in order to earn money using the difference in rates, you need to have an asset. On the stock exchange, you simply can not sell what the trader does not have. What can not be said about the CFD trade. Using contracts for difference, we can, literally, sell air. Absence of temporary delays, and minimal commissions is a huge advantage of trading on CFD. A contract for a price difference is a derivative. It is calculated based on the underlying real stock, product or index. Using such asset features, any willing trader who has at least a couple of hundred US dollars, can use his chance and trade CFD for shares, while receiving income from changes in the value of securities. The main distinctive plus of trading with an asset is the price: understated marginal requirements and the ability to use leverage, with low market adjustability, which provides an opportunity to conduct trading with small amounts. The player has the opportunity to use margin trading - a leverage of 1: 100. This level of the shoulder is not available on the stock exchange, for comparison. Reduced costs of funds and potentially high returns for the trader, this is the main positive aspect when choosing a CFD. It is with the help of the shoulder, as well as the opening of positions in any direction, we can increase our chances of success, and earn, which can not be said about the possibility of the stock market. The investor is given access to higher-level instruments, and CFD trading for stocks is directly dependent on exchange sessions, where the instruments change not only their owners, but also quotes. The CFD asset is a unique development, with which traders are free to trade shares, futures, indexes, and at the same time without huge funds. That is, the contract for the difference in prices, allows you to invest on the part of traders, in the asset class, while in reality they do not own it. But do not relax: increasing the leverage does not only increase the possible profit, but also contributes to the risks, as a result, increasing the potential losses of the trader. CFD is a highly liquid market instrument. But with all its merits, evaluate the final risks.